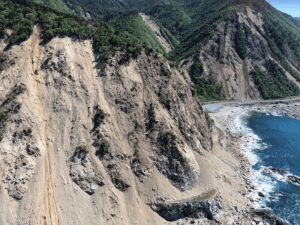 Last November a 7.8-magnitude earthquake caused more than 100,000 cubic meters of rock and debris to tumble down and bury the road below Ohau Point in New Zealand. The abseilers [Rock Remediation Technicians (RRTs)] of Hiway GeoStabilization (HGS) have been tasked to remove any future dangers and secure the remaining rock with ring nets, high-tensile steel mesh [TECCO mesh from Geobrugg), and rock bolts. Click here to read more. HGS, a joint venture between GeoStabilization International (GSI) of the USA and the Hiway Group in New Zealand, is contracted by the North Canterbury Transport Infrastructure Recovery (NCTIR) – the alliance formed to repair, the road and rail networks between Picton and Christchurch following the November 2016 Kaikoura earthquake. 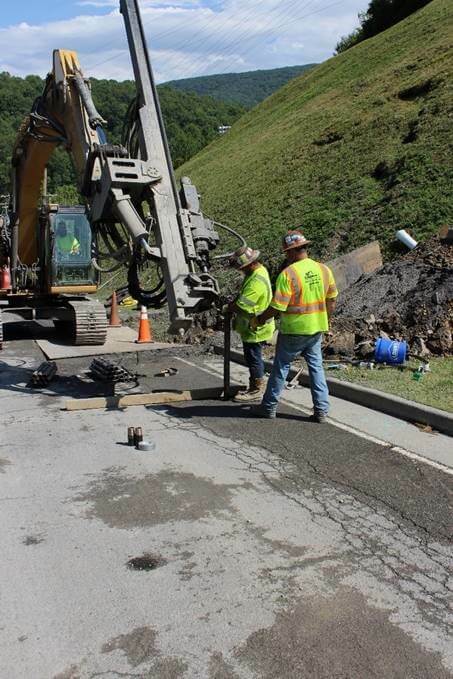 NCTIR aim to have the road open by Christmas this year, but work will work continue into 2018 to complete a number of improvements along the highway. As shown in the video contained in the above link, the experienced RRTs wear full-body harnesses and utilize secured lines to ensure their safety as they descend the steep, near vertical rock slope to secure the ring net and mesh drape to the face. HGS’ efforts, led by Mat Avery, began in March of this year and are on track to mount this largest rockfall drape ever to be installed in New Zealand by September. Following the installation of the ring net and mesh drape, which covers the top 4,500 m2 of the rock face, the crew will work to remove all of the loose rocks from the base of the drape down to the road level, an approximately 12,500m2 area. Once the rocks are removed, construction access can be granted below the rock face to begin construction of the new road and the HGS crew will move back to the top of the bluff to install 420-each rock bolts through the drape in a 1.8-meter grid pattern. This will secure the ring net and mesh to the face, while also anchoring the larger loose rocks, and complete the permanent design of the remediation allowing safe public access to the new road below. While the views of the ocean and wildlife are breathtaking, these crews have battled uncompromising weather during this project. The work performed by Hiway GeoStabilization is crucial for the safety of the traveling public who will be able to once again travel past Ohau Point once the road has been repaired.